Gathered in a school library flooded with light pouring in through massive windows overlooking a snow-laden Grandville Avenue in Grand Rapids, a group of 10-year-old students hailing from around the globe excitedly begin to discuss their future. 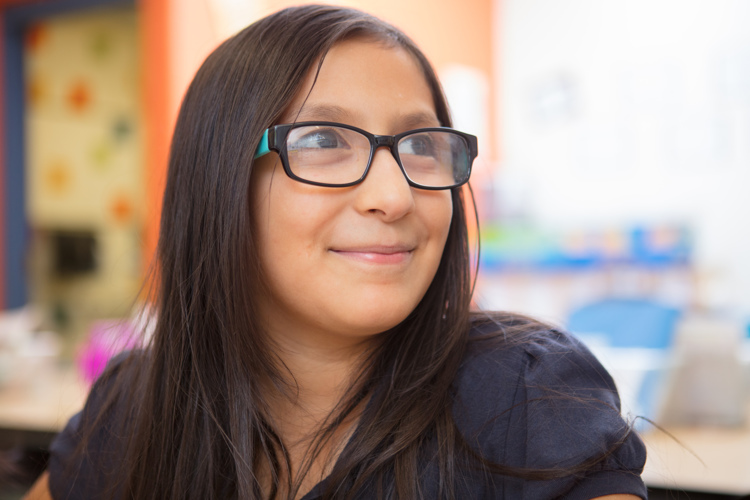 “I want to be a doctor, a doctor who works with kids, art — I love art, an inventor, and a scientist because I love science and experiments so much,” says Gabriela Garcia Lopez, a fifth grade student at Cesar Chavez Elementary School. Gabriela Garcia LopezGabriela’s peers, students at Chavez who once lived in places like Oaxaca, Mexico and Burundi in East Africa, too have big plans for their careers and are quick to proclaim an exuberant love for everything from science to sports. Raphael Irumva wants to first be a professional soccer and basketball player, then a policeman and, ultimately, a singer. Rubi Esquivel hopes to become a journalist and a pediatrician, and Perla Cervantes would like to be a veterinarian and a singer. Kevin Valeramaldonado details his career aspirations: soccer player, scientist and engineer, and Andy Guillen aims to work as an engineer or in computer technology. Raphael IrumvaAs they wrap up their dream career list, they begin to realize: they are interested in so much more. “Oh, wait! Writing! I love writing. I could be a writer,” Raphael says. “And Spanish and math, I love those,” Andy adds. As the comments grow, this clear show of enthusiasm brings smiles from the nearby adults — teachers flanked by a giant, neon green wall in Chavez’s library, an impressively modern space filled with a sea of books and student artwork. Andy GuillenThe smiles come, of course, because the teachers are thrilled to hear the children’s passion, but also because this medley of dreams tells a story of support and encouragement for students who, not that long ago, knew little to no English and were navigating a world that could feel overwhelmingly foreign and hostile.That these fifth graders now speak with such confidence about a future they’re looking forward to is, for the educators, not just representative of the students’ mastery of a new language, but of their ability to successfully traverse what amounts to an often emotionally turbulent landscape for those from other countries. In other words: these students, by the age of 10, have done something that many could never imagine: they have left the homes they have always known and traveled across mountain ranges, across oceans, across continents, often because they’re fleeing violence or economic despair, to arrive in the United States, a country they have never seen, a country where they understand little to none of the language, a country where they frequently know no one except for family. After all of this, they, every day, face a dauntingly different place with boundless grace: they learn a new language, they meet an almost endless stream of unfamiliar people, they begin an entirely new life. And they do it with a wholehearted embrace. It is these children’s stories, and the stories of the thousands of students like them in schools across Grand Rapids, that educators wish state officials could hear and take into account when determining how well a school is performing. Instead, GR teachers and administrators say they feel the state, and specifically the Michigan School Reform Office (which Gov. Rick Snyder in 2015 controversially moved from being under the jurisdiction of the state Department of Education to his own direct authority) focuses on data that is frustratingly and exhaustively punitive for schools with large groups of students learning English. There are a myriad reasons as to why educators frequently feel the state’s student performance test, the Michigan Student Test of Educational Progress, or M-STEP, is punitive, but it stems in part from the fact that students learning English are often facing an overwhelmingly greater number of barriers than many of their peers, including dealing with PTSD and trauma ( for example, some of the children are refugees and have experienced war), moving numerous times during the school year, not knowing the language the test is given in, and more — but they are expected to perform at testing levels akin to students not facing these issues. Additionally, educators cite frustration with how the test is administered. While some pupils can take portions of the M-STEP in other languages, such as Spanish or Arabic, they cannot do the assessment entirely in the language which they speak fluently. This means that a student who has been in the country for a year and has been speaking English for that long will be judged by the same standards as a native English speaker by the School Reform Office, or SRO — and this data can be used to penalize schools. For example, the SRO has labeled Grand Rapids’ Burton Elementary and Middle Schools, where the vast major of students are English language learners [ELLs], as two of the lowest-performing public schools in Michigan. This ranking is based upon results of the M-STEP. Using this list, the SRO determines which schools it will close — though Grand Rapids is not in danger of having any of its institutions shuttered by the SRO, GRPS' John Helmholdt told us. The SRO did not return requests for comment. The state’s decision to place Burton, and other Grand Rapids schools, on this list has landed fierce criticism from teachers, parents and other community leaders who argue the state tests are flawed and do not comprehensively gauge the kind of progress teachers are seeing from the students in, and outside of, the classroom that leads to academic, as well as social and emotional, success. This criticism, from Bahamonde-Gunnell and a host of others, is part of a deeply complex, and often contentious, testing landscape in Michigan that is garnering extensive analysis that city educators and researchers hope will result in a reformed testing process that follows in the footsteps of Grand Rapids' schools and becomes far more inclusive of ELL students. According to district statistics, there are 4,175 ELL students currently enrolled in Grand Rapids Public Schools [GRPS]. These students make up nearly 25 percent of the entire GRPS student population, which hovers around 16,500. Throughout Michigan, there are approximately 90,000 English language learners, which represents a growth of 45 percent over the past five years, according to state statistics. 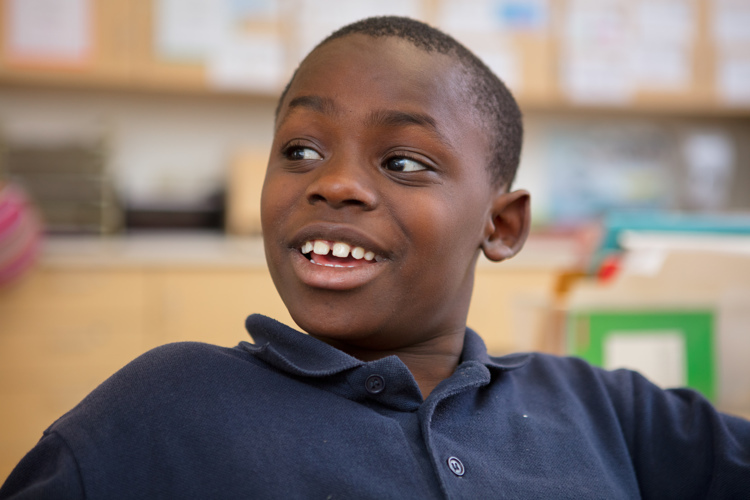 Representing about 55 countries and speaking around 54 different languages, the ELL students in Grand Rapids bring an incredible depth of knowledge about the world into the city’s classrooms. They have lived by the Nile and Mt. Everest. They are fluent in everything from Spanish and Arabic to Kirundi, spoken by about nine million people in Burundi and parts of Tanzania, the Congo, and Uganda, and Kinyarwanda, the official language of Burundi’s neighbor to the north, Rwanda. Many of the children speak multiple languages fluently. They are the sons and daughters of the migrant workers, many of whom come from Central and South America, driving so much of West Michigan’s agricultural economy. They have experienced governments being toppled. Increasingly, many of the ELL students are refugees and have been witness to trauma many of us could never begin to imagine, including having seen their home countries being consumed by violence in genocide and war. Some have spent their entire lives in refugee camps. 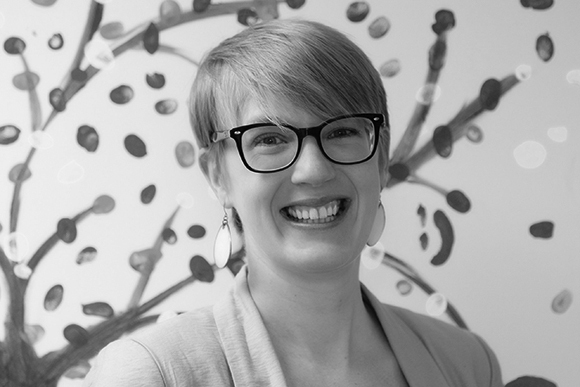 Susan KragtThey are an incredibly diverse group that makes Grand Rapids, both the city and its school system, a better place, as Susan Kragt, the Executive Director of the West Michigan Refugee Education and Cultural Center, recently wrote for Rapid Growth. And, of course, it is all of the ELL students who create this incredible mosaic of cultures that educators and children celebrate. While teachers, administrators and others involved in the education system all agree that assessment is needed, it, for many, becomes a matter of how those tests are created and for what the data is used. In other words: are goals and support for ELL students being taken into consideration when the test is being created and is the data being used to help schools better empower their students, including ELLs? Aimee GarciaCesar Chavez Elementary School Principal Aimee Garcia and Chavez teachers Sung Pak and Irene Reiniche, both of whom are ESL certified, note that some data from standardized tests is useful, particularly the numbers coming from one of four main standardized tests given to ELL students: the NWEA MAP (Measures of Academic Progress) exam, which is administered a couple times throughout the year to helps schools gauge how their English language learners are progressing. The other tests that ELL students take include: the WIDA (World-class Instructional Design and Assessment), which is used to determine English language proficiency; the M-STEP, which tests if students are able to meet state standards in English language arts, science, math, and social studies; and the DIBELS (Dynamic Indicators of Basic Early Literacy Skills), an assessment of literacy skills for elementary students. 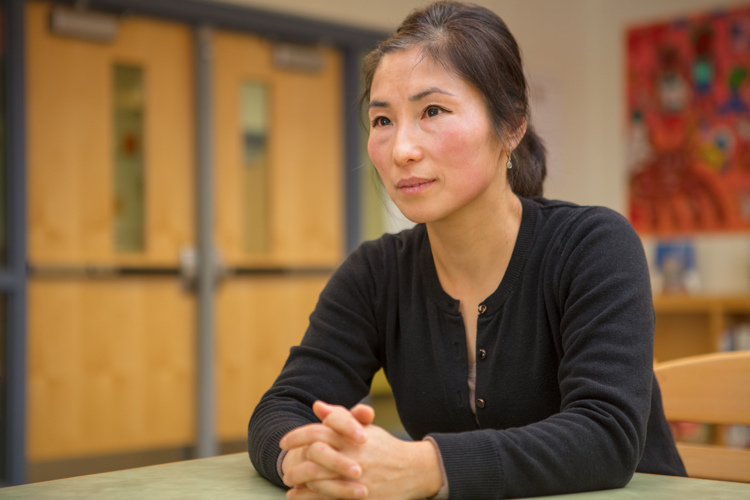 Sung PakIt is with the M-STEP, which in the 2014-15 school year replaced Michigan’s former state assessment, the MEAP (Michigan Educational Assessment Program), that Grand Rapids educators say they are most concerned negatively impacts their ELL populations and schools that are supporting them, in large part because the SRO uses the data for the “low-performing” schools list (which are a serious blow to morale in schools where teachers feel like they're already giving 110 percent, educators note) and is expected to use the M-STEP to defend school closures. Irene Reiniche“We move mountains, but the test doesn’t measure those mountains,” Garcia says, referring to the support that Grand Rapids schools, including Cesar Chavez Elementary, provides for its students. The problem with the M-STEP emerges at the beginning of its formation, says Dr. Rui Niu-Cooper, an associate professor at Grand Valley State University’s College of Education who has long worked with English language learners and those educating them — including having worked with student ESL teachers on matters of cultural sensitivity. “For the question designers, they should consult with parents, with teachers, with students — how do you design questions so they’re meaningful?” asks Niu-Cooper, who, while she was recently an associate professor at Aquinas College, applied for and received a $2.5 million grant from the U.S. Department of Education that aims to address the shortage of ESL teachers in Michigan by providing free ESL certification training for teachers throughout the area, including in Grand Rapids, Wyoming and Kentwood. Currently, there are about 150 ELLs for every ESL-certified teacher — a number that's far insufficient and growing increasingly so as the ELL population continues to grow, Niu- Cooper says. The professor continues, explaining that test creators must assess their own potential blind spots, particularly in regards to how to best minimize them in order to support ELLs. For example, she notes that a question on the M-STEP asked about a lawnmower — a machine that some English language students are not familiar with at all. Jan Ellis, a spokeswoman at the Michigan Department of Education, addresses these concerns. “Educators are routinely solicited for participation as item writers, passage reviewers, content reviewers, bias/sensitivity reviewers, and data reviewers across all Michigan assessment programs," she writes, adding that an Assessment Committee Participation Application is publicly available here. As previously mentioned, educators have said they support the idea of assessment in order to determine what schools, teachers, administrators, and others can do to better support their students. Those at The Education Trust-Midwest, a statewide education policy and advocacy organization, too have thrown their support behind assessments, and they are also encouraging the state to retain the M-STEP, instead of replacing it with another standardized test, as is expected to happen after 2017 following vehement criticism of the test from educators, parents and others. 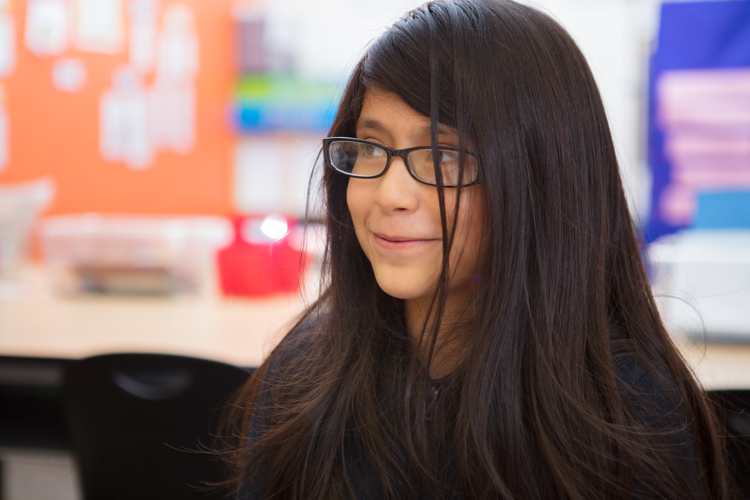 In response to educators’ concerns regarding the impact of standardized tests, and specifically the M-STEP, on ELL students and their educators, Gutman says, “We know that when we set high expectations for students that students and teachers rise to the occasion. 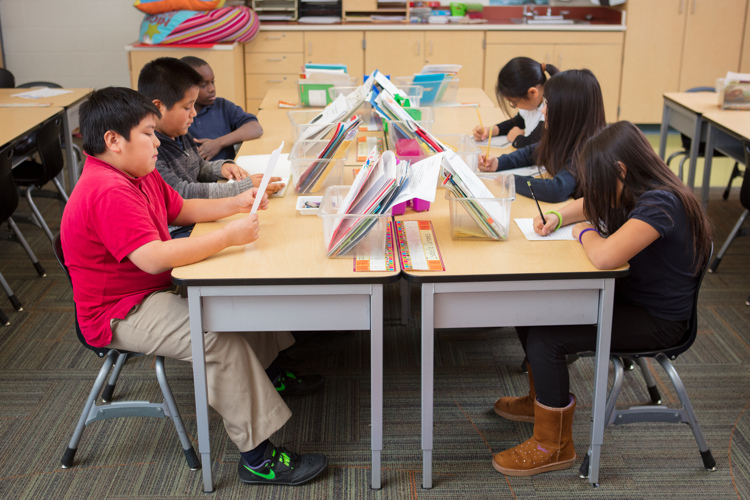 While there is disagreement over the kind of standardized testing that should occur for ELL students, there is widespread consensus, from the state to Grand Rapids Public Schools, Grand Valley State University and The Education Trust-Midwest that programs and other efforts aimed at empowering ELL students are crucial. GRPS offers a variety of educational programs for ELL students, including: bilingual dual immersion, for which instruction is given in both English and Spanish in classrooms; English as a Second Language, which uses a special curriculum to teach English to non-native English speakers; and sheltered instruction, a teaching method that employs such techniques or activities as connecting new learning to the child’s background in order to teach English. For example, at Congress Elementary, where about 30 percent of the students are ELLs, Principal Erek Kooyman explains that ELL students are integrated into general education classrooms, which Kooyman says has led to ELL students quickly learning English and feeling a part of their school community. “It’s so important to have a welcoming environment and provide language support for parents, too,” says Elisa DeMaar, who teaches a first- and second-grade class at Congress Elementary. “I always learn some of a child’s language, so I can say phrases to them in their language, and they know I care. “I want them to feel comfortable and very loved in the classroom, and most of all, I want them to feel safe and know I’ll always take care of them,” DeMaar continues as she walks around a classroom filled with students diligently working on drawing snowmen and women about whom they will later pen first-person (er, snowperson) stories. One such student, Ruth, who is six years old, is intent on coloring in her snowman that doubles as a “dinosaur robot.” Originally from Rwanda, Ruth first came to Congress one year ago speaking no English — now, she seems nearly fluent. Both Congress and Cesar Chavez Elementary Schools are what are known as GRPS cultural centers, of which the district has 16. 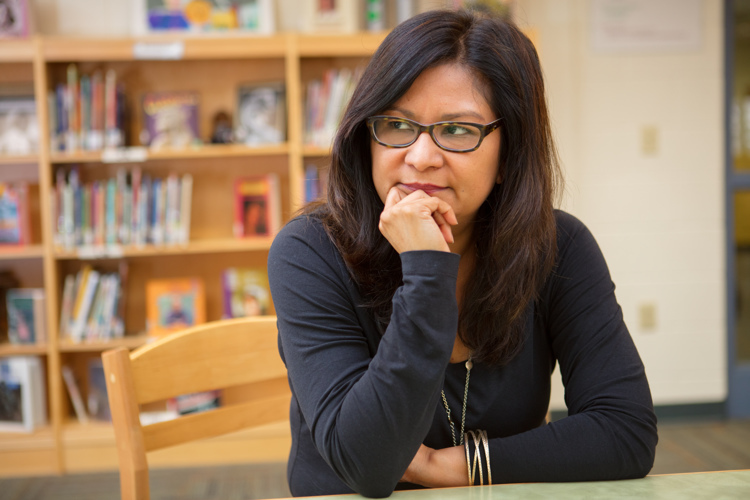 Meant to support ELL students, the cultural centers offer ESL-certified teachers and tutors to support students in before- and after-school programs. “Cultural centers used to be called language centers, but the name changed because they’re all about valuing the languages and the cultures of the students,” says GRPS’ Bahamonde-Gunnell, who moved to the U.S. from Cuba when she was five years old. For the city’s older students, Grand Valley State University has a multi-tiered approach to strengthening ELL education. Shinsky, the special assistant to the dean at GVSU’s College of Education, notes the school aims to open an ELL institute, and both he and Niu-Cooper, an associate professor of education at GVSU, explain the school has extensive coursework to discuss everything from the necessity for teachers to have empathy and cultural sensitivity with ELL children to classes focusing on designing assessments. In addition to all of this, Niu-Cooper says she hopes to raise enough money to open a center focused on providing support for parents, including with language, the job process, culture, and more. The Education Trust-Midwest, meanwhile, has received a four-year grant from Steelcase, which provides resources for the organization to “facilitate and strengthen their leadership team” in six elementary schools in high poverty West Michigan neighborhoods, which includes supporting ELL programs, says Chad Tolson, director of The Education Trust-Midwest’s Center for Excellence in Teaching and Learning. The two Grand Rapids institutions the organization is working in are Stocking and Sibling Elementary Schools. Tolson says he’d like to see more funding allocated for ELL students as a result of their work in the West Michigan schools, as well as other support. 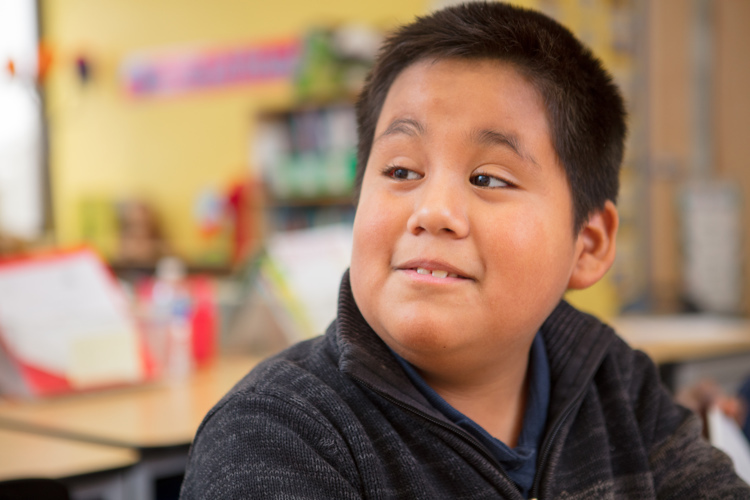 Whatever ends up happening with standardized testing and English language learners, educators say they hope the words that hold the greatest weight are those who are directly involved: the teachers and the students. That when a child speaks about their experience, those crafting policy and testing will take the time to listen. "It's happy here," says Ruth, the six-year-old Congress Elementary student. "I like it here because I can draw, and I feel happy."